In 1847, a form of solid chocolate was made by Joseph Fry & Sons. They discovered a way to mix some cocoa butter to the defatted or "Dutched" cocoa powder and added sugar that made a paste that could be molded, and made a solid chocolate bar. Later, they displayed it for eating in Bingley Hall, Birmingham, England. In 1851, Chocolate was introduced to the Americans the first time. Then in 1868, Richard Cadbury created the first heart shaped chocolate bar for valentine's day, and mass marketed the first boxes of chocolate candies. 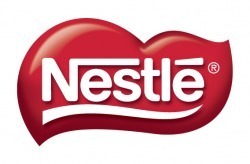 After experimenting for 8 years, Daniel Peter made the milk chocolate and joined Henri Nestlé to make the first Nestlé Company. 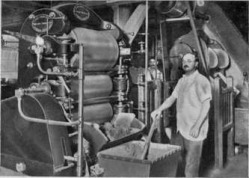 In 1879, Rudolphe Lindt added more cocoa butter back to the chocolate. After adding that, it made the chocolate snap and then melt in your mouth. In 1910 Arthur Ganong (August 3, 1877) used to go fishing with his company's employee, George Ensor. They used to put chunks of chocolate in their pockets for their snack, but it made their hands and pockets very messy, so they had an idea and wrapped the chocolate in cellophane. Later, they started making long moulded pieces of chocolate with nuts. This made a business miracle and they started selling the individually wrapped chocolate bar for five cents in 1898. They called their invention "Pal-O-Mine Bar"
Arthur Deinstadt Ganong was born August 3, 1877. He was a businessman and politician, he was born in St. Stephen, New Brunswick. 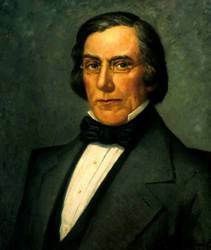 He had 6 other sibilings and he was the sixth child of James Harvey Ganong and Susan E. Brittan. His father and his uncle found the chocolate making company in 1873. On June 8, 1904, Arthur Ganong married Berla Frances Whidden, and they had 4 children. Ganong worked all his life in the family business and took over for his Uncle Gilbert who died without any issue. Arthur Ganong and company employee George Ensor developed a chocolate bar to take along on their fishing trips and in 1910 the company introduced the first 5-cent chocolate nut bar in North America. 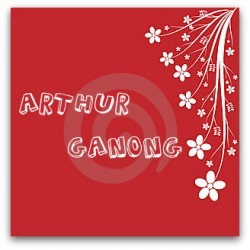 In November, 1960, Arthur Ganong died.